Kenney Mencher: If you live in the SF Bay Area and Need a Bike Tuneup I use these guys a lot and they are Awesome! If you live in the SF Bay Area and Need a Bike Tuneup I use these guys a lot and they are Awesome! The warmer weather is creeping in and Punxsutawney Phil did not see his shadow. This can only mean one thing; Spring is around the corner! Take care of bike maintenance now and be ready to ride come Spring. Use promo code, "SpringTime" to schedule a $49.99 full tune-up (regularly $79.99) plus parts. Limited time offer: valid through 3/15/2016. Schedule at www.beelinebikes.com or call 855-582-4537. We come to you - home or office! 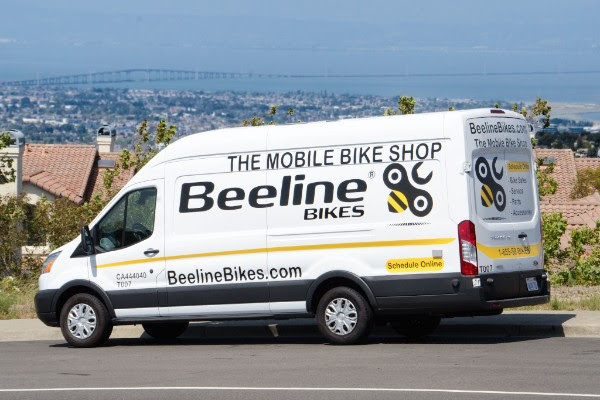 Whether it's a tune-up, parts and accessories, or a new bike, Beeline is the most convenient solution for all your bike needs! At a bare minimum we recommend a spare tube, patches (if the spare gets punctured), tire levers, CO2 (if not using a frame pump), a small multi-tool, and some spare cash. Check to make sure your tires have good tread life, that there are no cracks in the rubber or fraying sidewall threads. Pump up your tires. This is something that should be done regularly, but is especially important if your bike hasn’t been ridden in a while. Wet weather will wear a chain faster than summer conditions, so be sure that your chain isn’t worn going into Spring. Riding a worn chain will accelerate the wear on your other components, so change your chain sooner rather than later to save money in the long run. If your chain isn’t worn, be sure to give it a luxurious spring cleaning. A clean chain will not only be easier to pedal, but also last longer. Inspect the pads, and make sure there's an adequate amount of rubber. Mount your bike and test the performance of your brakes. If they're not responsive, have us take a look. The best way to ensure your bike is safe and running smoothly is to have a Beeline Bikes mechanic perform a full tune-up. We’ll clean the frame, lubricate the chain, inflate tires, adjust the front/rear derailleur, adjust front/rear brakes, bolt check the entire bicycle, check saddle/stem alignment, check & adjust bearing assemblies (hubs, bottom bracket, headset), remove & true both wheels, tighten the cassette lockring, and give it a test ride! Copyright © 2016 Beeline Bikes, Inc., All rights reserved. You are receiving this email because you have signed up for an account with Beeline Bikes.